The following post is sponsored by Linqia and Betty Crocker. If you've been reading my blog lately, you know we've been making a lot of cookies. Another batch of peanut butter cookies and two trays of Cranberry White Chip cookies were baked today. Which of the recipes from Betty Crocker's 24 Days of Cookies would you like to bake? 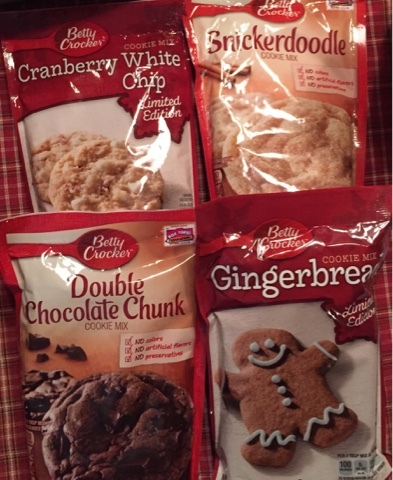 We are trying seven different varieties of Betty Crocker's cookie mix! You can find them on sale now, and click for coupons from Bi-Lo and Winn Dixie. My daughter has plans for the three bags of Gingerbread cookie mix, and I want to try decorating a few upside down gingerbread men cutouts as reindeer. The Candy Cane cookie mix helped us to quickly make these pretty swirled cookies. We will probably add colored sugar to the top of the Snickerdoodle cookies before we bake them and decorate the sugar cookies (not pictured) with colored icing. We have been so busy lately, and these mixes have been a welcome time saver as we #BakeMemories. So which one of these sweet treats will you try first? Enter this quick giveaway for $10 through PayPal, then grab your Winn Dixie or BiLo coupons to #bakememories too. I'd love to enter but your contest app is not working, neither in Chrome nor IE. Thanks for bringing this to my attention! I changed from rafflecopter to giveaway tools, and it is working now. Classic Sugar Cookies for me:) Thanks for the great giveaway! Red Velvet cookie cups, for sure! I would try Cake Mix Gooey Butter Cookies. I'd make Cake Mix Gooey Butter Cookies! Russian Tea Cookies look good! Easy Peanut Butter Cookie Cups! Chocolate and peanut butter, YUM! Thank you for the great giveaway. I love peanut butter and White chocolate cranberry. Peanut Butter Cookie Truffles look perfect for me - although I'm not sure I could wait for them to refrigerate til set!